The idea was romantic—not the love and un-platonic companion- ship candle- light-dinner romance, but more the lofty, idealistic romanticism. I synced my iPod, put my notebook in my backpack, and headed down to the seawall. Though it’s raining now, the sun was out this afternoon, and I didn’t have much to do today. And since I’d received a rare hand-written letter in the mail earlier this week, this afternoon seemed like an opportune time to draft my reply. My friend is an amazing writer. Bona fide. She’s a Ph.D. candidate in English at Berkeley. And without getting into specifics, I can say that her letter had this tangible sense of place. Part was written at an art museum, another at a cafe on Telegraph Avenue. So I thought I would return the favor by leaving my house to write back to her from an interesting environment around here. Where better than the seawall? 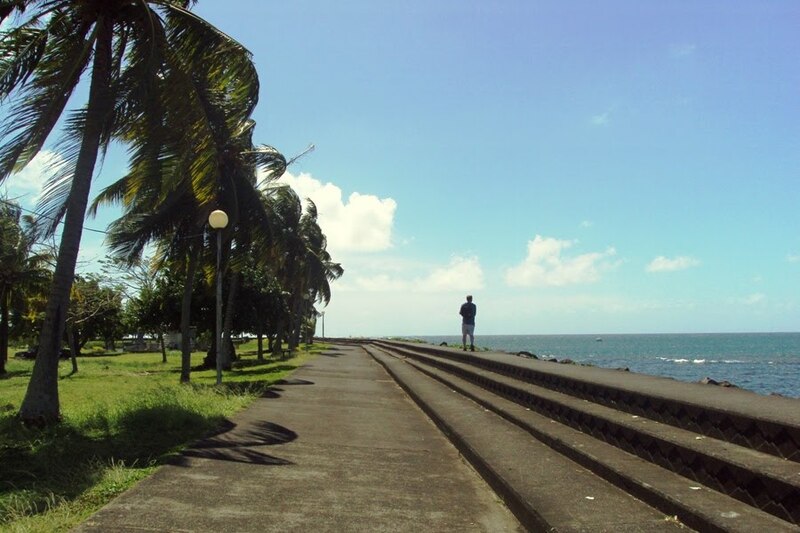 The seawall lines most of Apia Harbour, starting in the east at the shipping docks in Mata’utu, meandering along Beach Road, jutting out behind the Government Building, wrapping back in around the fish market, and riding into the sunset in the west all the way into Mulinu’u, which literally translates to “the end of town”. From what I hear, the seawall was constructed fairly recently after the last batch of hurricanes battered Apia’s waterfront severely enough a barrier needed to be put in place. It’s scenic and tree-lined, and there’s enough shade to keep a person comfortable in the early afternoon. The Harbour is about a 10-minute walk from my house, although getting to the greener shadier area takes another 10. Heading over, I remembered I had my iPod with me, and I had Bob Dylan’s “Like a Rolling Stone” rolling around my head, so I played that. The popular fashion in Apia is to wear one ear-bud, and let the other dangle aimlessly. I’m a slave to fashion. 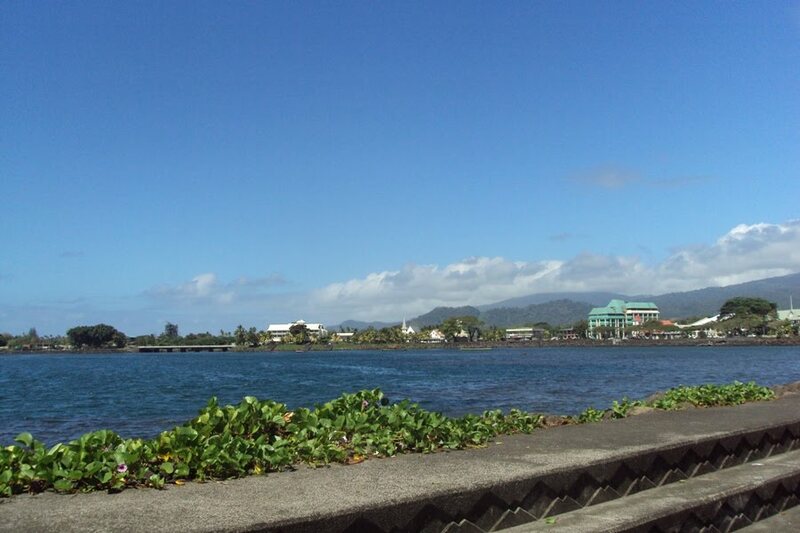 Saturday afternoons in Apia are a lazy affair. The shops have closed for the rest of the weekend, and the nightclubs haven’t yet opened. Constructions sites are quiet, and the roads are empty. Crossing the bridge at Mulivai, I waved to some girls sitting in the shade of a coconut tree near the Samoa Tourism Authority. I was in no rush for anything, so I had time to be selective about choosing a spot. A bench seemed like too much to ask for, but I wanted something a little bit away from anyone else, and shade and grass were important considerations. In the end I found a nice shady tree, where the grass was a little long, but not too bad. There was a lady sitting in a van reading the Samoan Observer nearby, but she didn’t bother me. I reached into my bag and found my notebook, and I scrounged for my pen. My pen. Where’s my pen? I didn’t bring a pen? I just put on this whole charade walking 20 damn minutes down the seawall in tropical sunlight, and I forgot my pen? 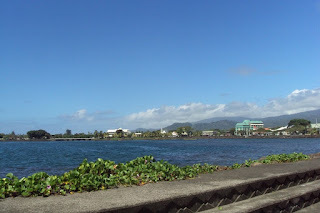 The Mata'utu skyline as seen from behind the Government Building. My favourite post thus far! It is the sort of thing I would do.